A few weeks ago, I blogged about post-secondary credit options for high school students in Ohio. 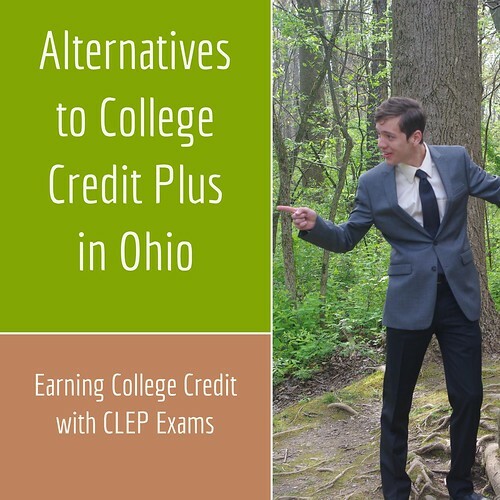 Ohio’s College Credit Plus can help you earn college and high school credits at the same time by taking college courses from community colleges or universities. The purpose of this program is to promote rigorous academic pursuits and to provide a wide variety of options to college-ready students. Taking a college course from a public college or university College Credit Plus is free. That means no cost for tuition, books or fees if you attend public school in the state of Ohio. If you choose to attend a private college or are homeschooled, you may have limited costs. There are many reasons a family might want to put their high school student into a postsecondary program, and one of the biggest is financial. But there are other options to the College Credit Plus program, and one of those options is CLEP or College Level Examination Program. CLEP stands for College Level Examination Program. CLEP is administered by the College Board, and is a legitimate way of getting college credit in high school. It even has its own page on the College Board Site. The idea is, that if you are already well versed in a certain subject, you can take the CLEP test on that subject and if you pass, you get college credit. If your college accepts the CLEP test results, you just saved yourself a lot of time and money. The CLEPing process is pretty straight forward. 1. See if the colleges you are interested in accept CLEP credits. You can do that at the college board here. Just type in the name of the school you are interested in and the site will take you there. Make a special note of the CLEP exams they accept. If they don't accept French I for example, it wouldn't make any sense to send the French I exam to that school. Also, note the score you have to have to pass the test. Most schools accept a 50. Schools like Ohio State in Columbus, OH only accept a few CLEP exams and demand scores of 60 and higher to be accepted. Be sure to check before you take the test! 2. Know your subject material. I found that my students were the most successful in passing the CLEP tests when they took them within a few months of finishing the high school course. Noah took and passed the biology CLEP exam the summer after he finished Biology in high school. He was also successful with American History Part II. My son Sam, who was always very good in Math, passed the College Math CLEP exam and American HIstory Part I, both when he was just a few months out from completing the course. 3. Study. It helps to have just finished the course for the exam you want to take, but it is also important to study. We found Instantcert to be invaluable in preparing for the exams. CLEP Biology, (REA) by Laurie Ann Callihan. CLEP Analyzing and Interpreting Literature. 4. Decide which test to take and then register for the exam on the College Board Site. Each exam is $80. The testing center where you go to take the exam will charge a fee as well. Altogether it may cost a little over $100 for each test.Each test is worth 3 to 6 college credits. When you register for your first test, you will also register an account with the College Board. After you register and complete your registration for a CLEP exam, you must print out the registration ticket. You have to bring that ticket with you on test day to the testing center. 5. There are testing sites all over the country. But not every school that accepts CLEP exams is a testing center, and not every testing center accepts CLEP credit! Again, the College Board site is your friend here in making those determinations. You will register for the testing center when you go to register for the exam, although in my experience, we had to pay the testing center separately, on the day of the exam. Government issued ID with photo and signature. This must be current. 7. You will have the option of sending results to the schools of your choice for free. Except for Composition, you will have your scores immediately. It is up to each school to grant credit for the exams. Noah passed the Biology CLEP exam. His school gave him 6 credit hours for that. He also got 3 for American History II. That was a savings of over $3600 dollars. My only regret is that he didn't take more of them! There are 33 CLEP examinations. Here are some of my CLEP links.